Remember the advice you heard growing up “Don’t hitch rides.” and “Don’t talk to strangers.” Well, I’ve done both. (Read my posts “a ride with strangers” and “attitude adjustment.”) Of course I didn’t “throw caution to the wind” until I was older, much older. Somehow it didn’t occur to me that I’d be taken advantage of; I was plump, graying, and sagging… just a little. Aren’t those weapons enough to keep the crazies at bay? Although these days I’m not so certain. Nonetheless I continue to enjoy speaking with strangers. As for riding with them, it depends on how desperate I am to see my daughter. Hopefully, I won’t need to “test those waters” again. I can’t imagine that a second experience could be more amazing than my first. During our trip to Venice, I had one of the warmest encounters with a total stranger. 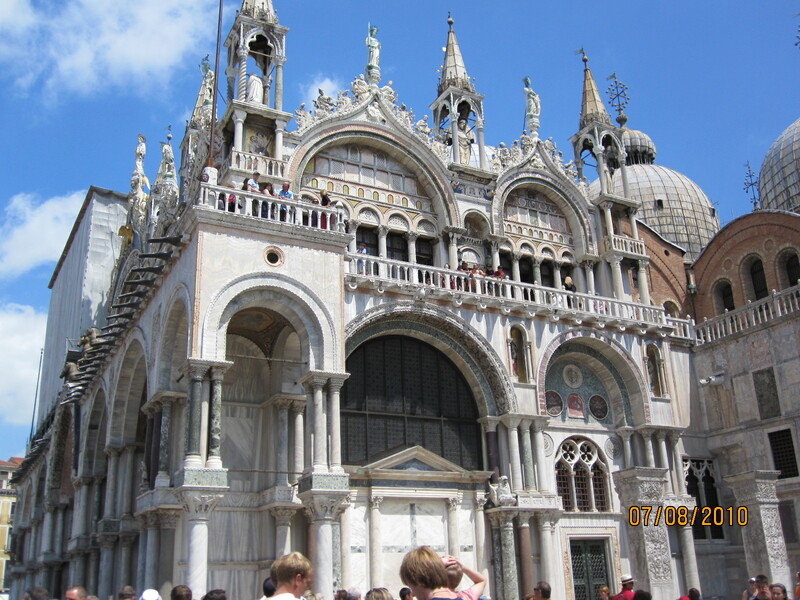 Having left St. Mark’s Square after a couple of very informative, very historical tours of St. Mark’s Basilica and the Doge’s Palace, we meandered through the small, back streets surrounding the Square. We were in search of a couple of shops recommended by Rick Steves in “Venice 2008.” On the hunt for a gift for one of my daughter’s male dancer friends, I found “…two fascinating mask and costume shops. The Ca’ del Sol… and Atelier Marega…” While I didn’t purchase a mask from either, I did wander through both, “oohs” and “aahs” spewing forth. The only other time I’d seen a proliferation of masks was in American theme parks, like Disneyland and Busch Gardens. And believe me, they’re not the same. Venetian masks are serious business. “In the 1700s, when Venice was Europe’s party town, masks were popular–sometimes even mandatory–to preserve the anonymity of nobles doing things forbidden back home. At Carnevalle (the weeks-long mardi Gras leading up to Lent), everyone wore masks. The most popular were based on characters from the Low-brow comedic theater called Commedia dell’Arte. We all know Harlequin (simple, Lone Ranger-type masks), but there were also long-nosed masks for the hypocritical plague doctor, pretty Columina masks, and so on. 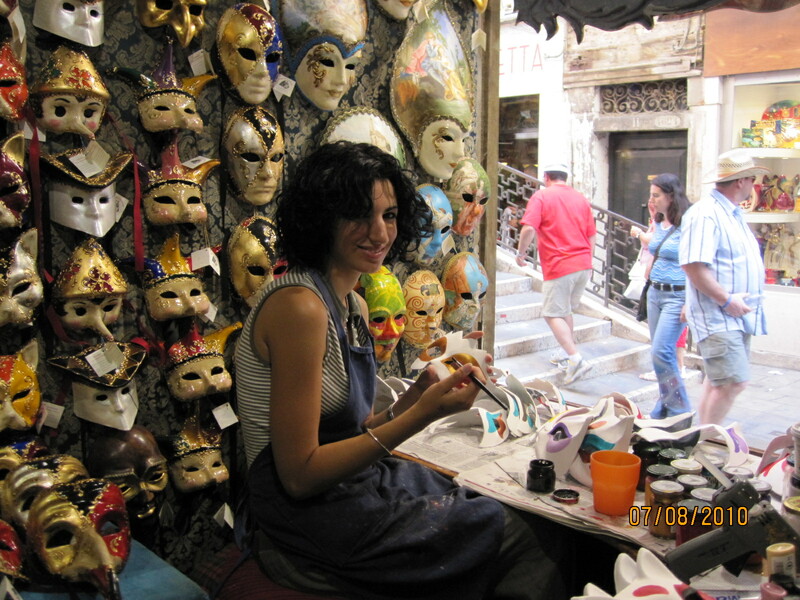 Masks are made with the simple technique of papier-mache. You make a mold of clay, smear it with Vaseline (to make it easy to remove the finished mask), then create the mask by draping layers of paper and glue atop the clay mold.” Perhaps I should have kept up mask-making when I left kindergarten. Maybe then I wouldn’t be here attempting to eke out a small income from writing. But it’s better I do what I do best, and leave mask-making to those for whom it is obviously a passion. I found such a person in Barbara Lizza. Being too overwhelmed by the tremendous inventory of beautiful masks in the shops recommended by Steves, I wandered in and out of smaller ones. The offerings were fewer, but no less gorgeous. Unable to commit, I asked my husband to continue on and scope out more shops, while I tried to make up my mind in the ones at hand. A few minutes later he returned saying there were no others across the small bridge just ahead. Returning to a tiny shop where I’d been earlier, I was pleased to be the only customer. Moving about more easily than before I admired masks resembling story book animals, hanging from the low overhead beams. They were so charming in their pastel shades, a frog, a pig, an alligator, a rooster, among others. Assuring myself they were probably pricey and inappropriate for dancers in their mid-20’s, I pressed on in my search for the right mask. Sitting on a shelf about knee-high, were exquisite eye masks. They were a matte black, with glitter sprinkled thickly around the eye holes and on the leafy extensions that swept upward on either side. Unable to select from ones bearing silver, gold or red glitter, I picked up all 3 and deposited them near the laptop where purchases were made. Hunched over the computer was a pretty, young woman. Straightening herself, we made eye contact and smiled at one another. Breaking the silence, Miss Lizza took the mask framed in red glitter and placed it to her face, so that her eyes peered at me through the holes. Ripples of laughter bounced off the stucco walls, as we made small talk. I told her that the masks were for my daughter and her friends who were dancers. That elicited a confession that she’d been a ballet dancer for several years. Rushing to a small room off to the side of the main shop, the young woman rifled through packages on a shelf. Finding what she sought, she turned back toward me carrying a plastic bag filled with used pointe shoes. She removed a pair, proudly showing them to me. I joined in her excitement as she spoke of bygone days. Eager to tell me about her days dancing, she struggled to find the correct words. I admired her fortitude for pressing onward. 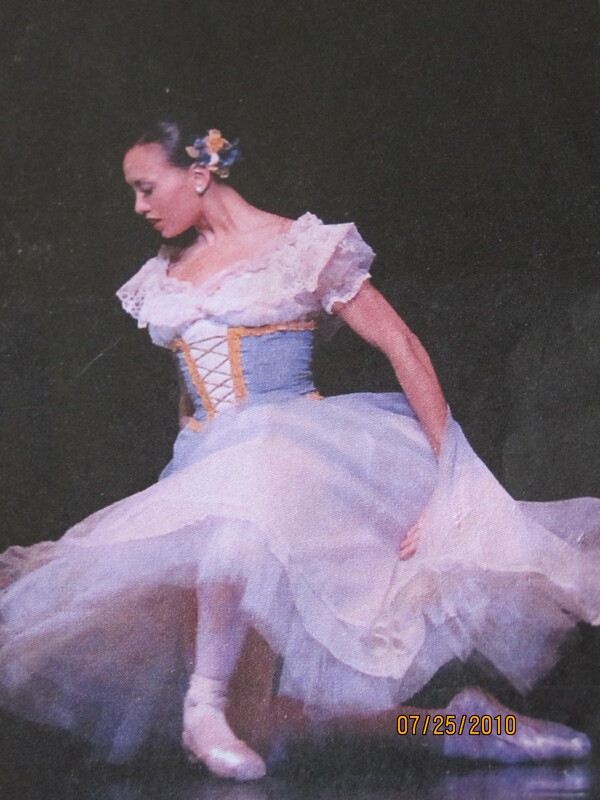 It seemed Miss Lizza might have pursued a career in dance, but was dissuaded by family. So while she might have been disappointed, she forged a new career in mask-making. From what I saw of her work in the shop, I expressed great pleasure in her obvious talent. As I am wont to do, I rummaged through my handbag pulling out a picture of my daughter, cut from a tourist booklet printed in the town where she resides and dances. I showed it to Miss Lizza who gasped, exclaiming how beautiful my daughter was and how proud I must be of her. I then explained that there was a video of my daughter dancing on the internet. Miss Lizza quickly bent down typing away on her keyboard, asking me where she could find the video. We had difficulty bringing it up, but she did find my daughter’s name and Facebook page. Asking if it was okay to “friend” her, I consented. As this young, Venetian, former, ballet dancer attempted to compose a message, I marveled at what was happening. A world away, a stranger was on the verge of making my daughter’s acquaintance, sight unseen. I was becoming emotional so that when Miss Lizza wrote “Your mother is standing here beside me and…” I began to cry and then bawl uncontrollably. I missed my daughter very much and felt her presence in this young woman perhaps 10 years her senior. As she and I hugged, I felt like I was holding my own daughter in my arms. Miss Lizza comforted me, telling me she could sense how sensitive and sympathetic I was. We laughed in spite of my tears, for we were behaving like long-lost relatives unexpectedly meeting in a shop, with people wandering in and out. After several attempts at saying goodbye, I turned towards the door to see a very tall, very broad young man staring at us looking dumbfounded. Miss Lizza announced that he was her boyfriend, explaining to him in Venetian what had happened. Passing him on the way out, I told him he was very lucky to have a beautiful, charming girlfriend. Venice remains special for me, and I will never forget that young woman who felt like a daughter,… if only for an hour or so.